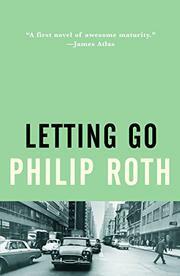 This is Philip Roth's first novel, following Goodbye Columbus, his exhilarating, uncompromising collection of short stories. It may seem somewhat surprising that he has shed the discipline of that medium to the extent of writing a book which is easily three times as expansive as most. Perhaps in the beginning there is a certain diffusion of interest in the proliferation of backgrounds, characters, talk- expert as it is (the spoken word when written loses nothing in transition). But by the halfway mark, the book gains in definition and drive. This is the story of Gabe Wallach, who has disengaged himself from his background (i.e. a supplicant, widowed father- his Jewish faith) to go to Iowa, then Chicago to teach. A cautious, civilized young man, he "values passion" but avoids it. He is a solicitous friend to the Herzes- Libby and Paul- who through their mixed marriage (Libby is a Catholic) have gone through familial excommunication to now find themselves increasingly unhappy together. But while Libby holds a certain wistful attraction for Gabe, a Jamesian intellectualized rapport- (James is a taste they share)- it is Martha Regenhart, a divorcee with a heady allure, with whom Gabe has an extended affair. And although he officiates for the Herzes in securing a baby (black market) for them, he is also partially, responsible for the fact that Martha loses her two children. It is only through all these "shufflings and separations", the "rejections and the yearnings, the demands and the hesitations and betrayals" that Gabe finally confronts his own futility. And it is ironically his one attempt to do something which is affirmative which reveals, once and for all, the ineffectuality of his marginal existence.... Roth, in this field trip just outside of the Marjorie Morningside country, would seem to posit that the assimilated Jew may fail to be an assimilated individual; one step, one generation removed from family and faith, the displacement leads to spiritual and emotional destitution. It is a clear-eyed, tough-minded contemporary commentary, and it has all this young writer's remembered virtues: bluntness, decisiveness, and above all an undiminished vitality which promises that his readers will not let go. It will get attention.